These are relatively old news now, but I was planning to post them here, so I’ll stick with that. 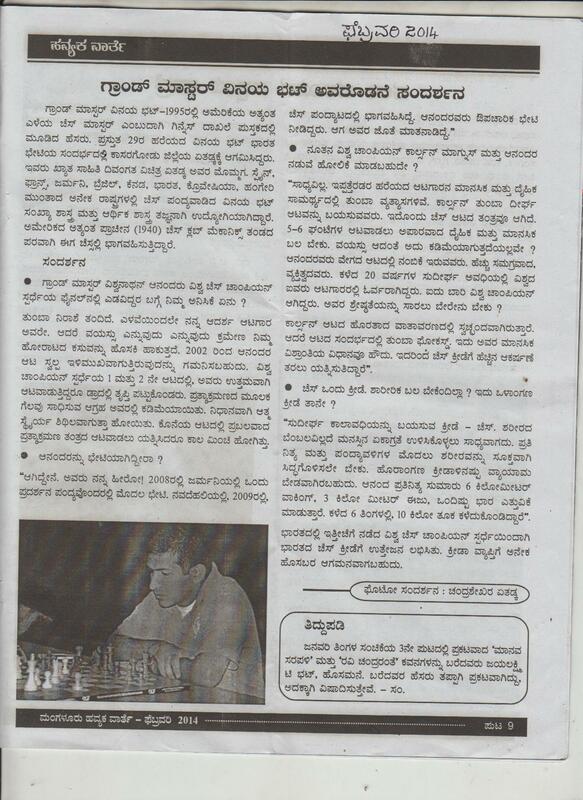 They are two similar articles, one published in the Kasargod daily Uttaradesha (the district in which my paternal grandparents live) and the other (the scanned image below) published in Havyaka Varthe, a Mangalore (a bigger city, a bit north of Kasargod) publication. The interview was conducted by my uncle (Chandrashekhar Bhat) when I was in India in late November/early December 2013, maybe a week after the end of the Anand-Carlsen match. As I’ve written here before, I said then that I thought Anand would likely skip the Candidates and largely retire from active play in 2014. I was definitely wrong about the Candidates, and for the moment, it looks like I’m wrong on the active play part too! I’m hoping he does well in the soon-to-be-starting Candidates, but I still can’t say that I have high hopes … A middle of the pack finish is what I’d expect for now. I can’t make out any of it. That newspaper has a serious font problem. Haha, that’s one way of putting it.